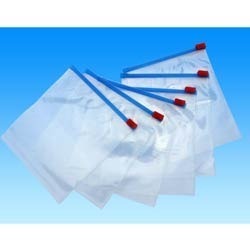 We are a prominent name, which is engaged in offering a superior range of LDPE Slider Sandwich Bag. This range is designed & developed utilizing innovative machinery and latest techniques in strict adherence with the industry laid norms and standards. Along with this, the offered range is available in different attractive colors and logos printed on the packets. Our personnel ensure to design this range ensuring its reliability, versatile usage and cost-effectiveness.